Trendy little whisky bar tucked away between the office towers of Perth. Helvetica was reviewed on Thursday 8th December 2011 16:45 by Richard. Helvetica is one of the original pioneers in Perth's emerging 'small bar scene' along with others including; Wolfe Lane, Cheeky Sparrow, Andaluz, Ezra Pound etc. This tiny little bar is hidden down an alley way off Howard street. Don't let it's secluded location fool you, it is known to be packed out on Thursday and Friday evenings, with the line sometimes snaking it's way toward Howard street. I left work a bit early for a cheeky sundowner on Thursday and there was no line at all but within two hours a small line started to develop outside. The bar specialises in whisky (or whiskey, depending on what side of the pond you're from) and regularly stocks over 70 different varieties hailing from Scotland and all over the world. You can buy it by the shot or by the bottle (they will even let you keep it there for future visits). If you are not into whisky there is also a small range of beers, wines and cocktails that seem to change every now and then. Bar staff were really friendly and talkative and they knew their stuff. I asked about a couple of the Japanese whiskys and they were able to tell me about them in detail, comparing their taste to other whiskys I was more familiar with. It's all to often you go into a pub, ask if something tastes good and you get "Yer it's orrite aye". Thanks for the helpful info buddy! Drinks across the board were fairly reasonably priced, however, some of the more mature whiskys are quite pricey, but you get what you pay for. We ordered a few of the bar snacks to have with our drinks as they don't have a kitchen (having one would probably halve the bar's capacity). The snacks are very reasonably priced and delivered exactly what they promise, no frills, just something tasty to get you through to dinner. It's a pleasant change from paying more than double for a similar dish because it has a fancy name or because it comes resting on a bed of some sort of vegetable you've never heard of. The crowd mainly consists of city workers looking for an after (or during) work drink and the average age is generally quite young. The thing I love about Helvetica is that it's quite secluded and even with the media attention they have had as part of the coverage of Perth's 'small bar scene', it's surprising how many people still don't know about it. Helvetica has and always will be one of my favourite inner-city small bars. It's great place to unwind after a stressful day at the office and you don't leave with a hole in your wallet either. 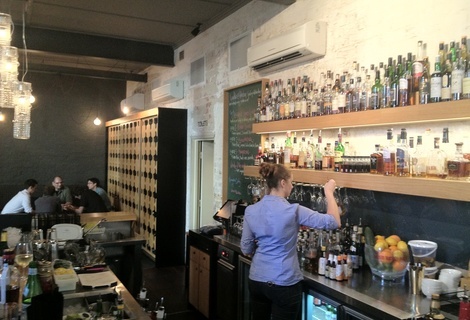 8/10Andaluz Tapas Bar in Perth, WA (13m away)Central small bar with quality tapas and fantastic cocktails. 7/10Greenhouse St. Georges Terrace in Perth, WA (73m away)Hippy heaven, an environmentally friendly place with great food. 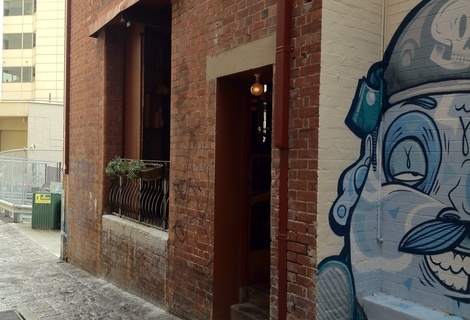 8/10The Sentinel Bar & Grill in Perth, WA (103m away)The emerging face of Perth inner city bistro dining.